In the wild, they consume snails, insects, craw dads, and other aquatic organisms. Found in shallow stagnant waters such as swamps, ditches, and bayous. Rooted aquatic vegetation is preferred. Often found on land in moist habitats. Lower Mississippi river valley north to western Kentucky. West to central Texas. As with all mud turtles, Mississippi Muds require ample access to haul out. They are frequent baskers, and will utilize an extensive land area if provided. Tank decorations such as rocks and aquatic plants are appreciated as these turtles like to prowl and explore their environment. A 20L aquaria is adequate for one individual. Tank size needs to be larger if they are to be kept in a group, or with other turtles. Larger river pebbles is a good substrate, as it gives them a sense of security, and allows them to poke and prod around in their wanderings. A good basking lamp is essential to their upkeep. Though more forgiving in regards to water quality than some other turtles, strong filtration is advised, as these turtles are somewhat messy in regards to their feeding habits. In captivity, Does well on high quality turtle pellets such as Mazuri and ReptoMin, as well as earth worms, crawdads and feeder fish on occasion. Mississippi mud turtles do well in a community situation with basking turtles such as cooters and sliders provided the size difference is not too great. Water depth preference can be problematic when choosing tank mates in a community setting however. Great caution is advised when housing this species with others of its kind, or with closely related species. Aggression often occurs, and damage can be swift and irreversible. This is most pronounced when maintaining males together, or maintaining males with unreceptive females. Mississippi mud turtles seem to prefer shallower water than some other types of mud turtles. This is especially important when maintaining young specimens. Not being strong swimmers, they can become disoriented and drown in water that is too deep. This is less of a problem with adults, which are able to cope with water depth of 8" or greater provided they have sufficient tank decorations to climb on, and easy access to land area's. 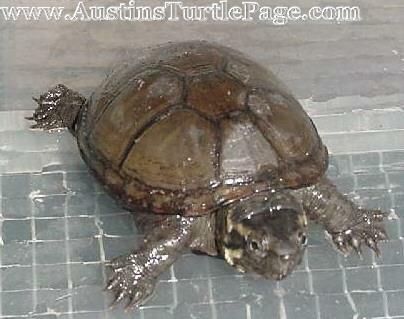 Mississippi mud turtles are less aquatic than musk turtles, and are poor swimmers by comparison. They are often shy, and need an extensive land area to feel comfortable and prosper. Water levels should be adjusted accordingly.